Finally, the day has arrived. After a long time the race for the leadership of the New Democratic Party will be decided. The new leader will be the leader of the Official Opposition to the Conservative government of Stephen Harper. After Jack Layton's remarkable achievement of leading the NDP to the historic high in members of parliament to become the Official Opposition, cancer took him from us. He was a beloved person and admired as a politician by many Canadians well beyond the NDP. The party's great success in Québec was an unexpected event to almost everyone maybe even Jack. 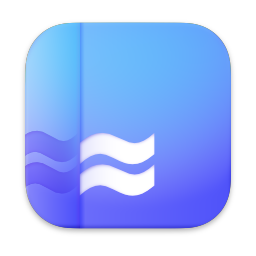 The people of Québec had decided to try seriously to support a federalist party after the years of parking their vote with the Bloc Québécois, the spokesmen for separatism. In spite of a long drawn out leadership campaign the strength of the NDP has held. We recently learned that most Canadians would be willing to see the NDP for the government someday. The traditional view had been that it was a useful "conscience of government" and a force to bring about social improvements, but not necessarily forming the government. Also, we now read that the NDP has equal support nationally with the Conservative government at 30 percent. The strength of the NDP has held in spite of the skillful and dynamic leadership of Bob Rae, the leader of the Liberal Party. (a former Provincial NDP government leader). The NDP has survived this period of transition united and strong. The new leader has much to work with and live up to. I am a lifelong supporter of the New Democratic Party. I have always thought it has very skilled and admirable candidates and members of parliament. It also has consistently been the party to speak up for the underdog, minorities and those individuals and groups in need of government services. It is the party that gave us Tommy Douglas (Canada's Greatest Canadian) and inspired out national health plan, which is the one social program that Canadians like the most. I have always been on the fringe of the party. Unlike most New Democrats who seem to want to soft pedal our socialist roots I do not shy away from calling myself a socialist. I still remember the struggle of the Waffles within our party to make the NDP be the instrument of creating a truly Socialist Canada. I guess I am still stuck in the past. After the party purged itself of it young socialists, I was saddened. This move of the party more to the centre dismayed me but I continued my support for their was no other option. A couple of the candidates running for the leadership of the NDP want to be too cosy with the liberals. Thomas Mulcair, who seems to be the candidate in the front of the pack is a former provincial Liberal politician and is one of those who want to move the party toward a more centrist position. I guess I am one of those who thinks if the electorate wants a liberal party they will turn to the real Liberal Party and not the NDP. I believe we need to hold the left of centre position and build on it. The Conservative Party is on record to want to drag the political centre of Canada (which they admit they do not represent) to the right so that conservatism becomes the new normal. We should not oblige them so easily. Another candidate is Nathan Cullen. He wants to cooperate with the Liberals to strategically run the next election to defeat the Conservatives by not competing with each other in certain ridings. I think close cooperation with the liberals has historically brought us short term gain and long term pain. When we have supported Liberal governments or formed a coalition to form the government we have achieved program goals but come out of the arrangement weakened as a party. I, therefore, am not a strong supporter of either of these candidates. The other strong contender is Brian Topp. It appeared he was the anointed one as many long time leaders of the Party such as former leader Ed Broadbent endorsed him early even before we know who all the candidates would be. It seems like an effort to get their inside man out in front. This has made me suspicious of him although he is a strong social democrat and worked closely with Jack Layton as he was the President of the Party. He does not have a seat in parliament which will limit his effectiveness until he gets a seat. There are other interesting candidates. Paul Dewar is a strong candidate but his effectiveness with our large group of French speaking members of parliament and a French speaking public in Québec, is in question as his French is marginal, the weakest of all the candidates. I am fascinated with Nikki Ashton. She is young and claims the youth vote. She also comes from a Northern Manitoba rural riding which includes Thompson. (If polar bears could vote she would be a shoe in as this is the polar bear capital of Canada). She comes from a strong NDP family; her father is in the Manitoba government. Martin Singh is a fascinating person. He is a convert to Sikhism and from a small town Nova Scotia of all places. He is definitely and outsider without a seat in parliament and few endorsements. He probably will be the first candidate eliminated. He is personally a rather fascinating man who does not lack in confidence in his own abilities. The candidate that I most like is Peggy Nash. She is a long standing member of the NDP and has served the party both inside and outside the parliament. She defeated a popular Liberal candidate to gain her seat this time. Her roots are deep in the social democratic base of the Party. She has been a powerful figure in the labour movement and is a skilled negotiator for labour contacts. She is very personable. I think she will be a formidable leader of the Opposition in the Parliament. Well I am awaiting the outcome of the election today. For a political animal like me the days forward will be very interesting indeed. I usually try to write something for Black History month. This year in spite of reading a lot about some inspiring experiences of black Canadians I let the month slip by without a posting. Well I have a second chance. Recently, two remarkable Black men have died, Herb Carnegie and Lanier Phillips. They had very interesting relationships to Canada, which are worthy of remembering and celebrating. Herb Carnegie, died last Friday , age 92. He has long been remembered as the "best hockey player who never played in the National Hockey League". 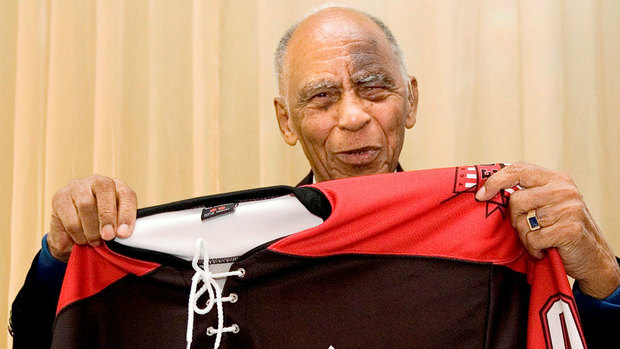 He played during the 1940's and discrimination and his own pride, kept him out of the NHL. 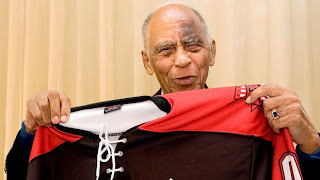 About the time that Jackie Robinson came to play in Montreal as the first step to his breaking the colour barrier in baseball, Herb Carnegie was being kept out of hockey because he was black. He could have done for hockey what Jackie Robinson did for baseball. Finally he was offered three different chances to play for minor professional teams in the New York Rangers organization. He refused because he knew he was good enough to play for the parent club and considered it an insult to be paid less than is hockey equals and sent to one of the minor pro clubs. He also was married and had three young girls and a wife he needed to support. You can read more of his story here. I hope you will take the time to do so. His historic moment was lost. The Toronto Maple Leafs would have been the club for him as it was the team in his home town. Connie Smythe is seems was somewhat a racist or at least a coward when it was reported he said he would pay $10,000 to the first person who could make Herb Carnegie a white man. 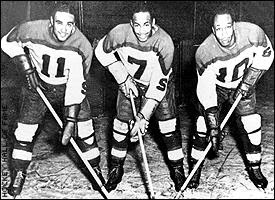 Herb Carnegie played hockey for minor pro teams in Northern mining towns and in the Quebec League on an all black line with his brother, Ozzie and Manny McIntrye, called the Black Aces, Playing for the Quebec Aces). He was admired as a superb skilled hockey centreman by teammates such as Jean Beliveau who did come to play in the NHL. For Carnegie, his life eventually moved on. He became a successful businessman, financial advisor , motivational speaker, outstanding amateur golfer and philanthropist. He began a foundation, which one of his daughters manages today. It awards scholarships to young people to go on to University. Herb Carnegie is in the Canadian Sports Hall of Fame and he was awarded the Order of Canada medal. Someday soon I hope he will be inducted in the Hockey Hall of Fame, where he deserves to be. This could be the greatest tribute that could be granted him for all his life he loved the game of hockey and his story is one of the great bittersweet stories in Canadian sport. Lanier Phillips, died last Sunday, age 88. he was an American who came to leave an inspiring personal story that forever has linked him to Newfoundland. I did not know his story until recently when I read a reference to it on the American Ambassador to Canada's website. 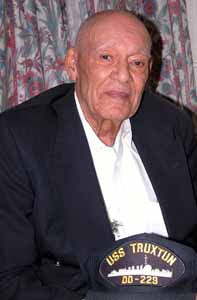 He had travelled to St. Lawrence and Lawn Newfoundland for a commemoration ceremony of the ship wreck of two American warships, the USS Truxtun and USS Pollux on February 18, 1942. Lanier Phillips was in attendance. He had been a sailor on the Truxtun. 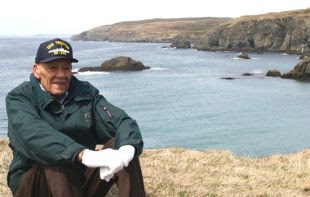 He was the only black sailor to survive with the help of local fishermen and miners. Over 200 sailors perished and 43 survived. and here on you tube. This is a history less worth hearing. Lanier Phillips life was changed for ever. He had a new appreciation of white people and knew that the social situation in Georgia need not be that way. His life since has been one of fighting discrimination. He marched alongside Dr. King and fought with the school system in Boston to get his daughter in an integrated school. Throughout his life he has told his story and the transformation it brought to his life. Over the years he has maintained a relationship with Newfoundland and returned many times. You can find you tube videos of Lanier retelling his story. Here you can read all about this historic event and hear some of Lanier own account. Newfoundlanders have not forgotten Lanier Phillips. The people of St. Lawrence and Lawn every year have a service of commemoration of those American sailors who perished on their shore and celebrated the lives of those who were saved. Lanier Phillips was awarded the Order of Newfoundland and Labrador. He was also awarded an honorary doctorate by Memorial University in Newfoundland. Lanier Phillips overlooking Chambers Cove upon which the ships crashed and he came ashore. Lanier Phillips story is inspiring. As a result of his experience of being rescued by Newfoundlanders, his life found purpose and direction. He went to the manage to get himself into the training program for radar technicians. He was told as a black man he would never graduate but he did, (the first black American to do so) and he went on to have a naval career . He may have been surprised at the way Newfoundlanders treated him but Canadians should not be. Newfoundlanders have a long tradition of going to sea as fisherman and now oil workers. They know the anguish of giving up their men to the sea. They would not hesitate to try to rescue sailors no mater the risk to themselves. They also have a long respect for men in the military. They have a legacy of sending their men to war and having far too many of them coming home. The WWl battle of Beaumont-Hamal was a great defeat that left almost every family in Newfoundland lose a male member, who served with The Blue Puttees. To this day, while the rest of Canada celebrates Canada Day, July 1, Newfoundlanders celebrate Memorial Day, commemorating the loss of a generation of their men in this battle. We should not have been surprised at the generosity of the Newfoundlanders after 9/11 when they welcomed and cared for airline passengers diverted to Gander, it is part of their history of doing what they can for those, "lost in a storm". Both of these men, Herb Carnegie and Lanier Phillips have added to Canada's legacy. They over came difficulties in their lives, took the lessons they learned and went on to contribute to society in many ways. They have inspired others and will long be remember as men of noble stature among us. I recently came upon a couple of interesting facts about Toronto, the city I was born in and raised near. It has an outstanding library system. In fact, it is one of the most used library systems in the World. About to open it's 100th branch library it is very extensive and available in every neighbourhood in the city. It is also well used not only by established English speaking Torontonians but also well used by recent immigrants. It is a keystone social institution in the city. Toronto is a very literate city. At a time when many cities are having a reduction of the number of daily newspapers due to competition from new forms of media through the Internet, Toronto continues to have four major English language daily newspapers, The Toronto Star, The Globe and Mail, The National Post and The Sun and one Chinese daily newspaper. Besides this there are countless weekly ethnic newspapers service non English speaking communities. Newspaper circulation in Canada is second only to Belgium. These two interesting facts about Toronto is even more interesting when we find out that Canada is the greatest user of the Internet. This appears to be in addition to the continued devotion to the printed word in books or newspapers. It seems the Toronto Public Library system has continued to change and adapt to the needs of the broad spectrum of citizens using all the resources of technology as well as references to printed material.Toronto is indeed a very literate and intellectually curious city. As a child, I remember my mother's great use of the library. When we moved to Port Credit when it was a small community outside of Toronto, she regularly used its very small library. She would walk us , often the three of us, the mile of so to the library, (we had no car). She would bring home six or seven large books, which she would read within a couple of weeks (neglecting housework). When it was time to get more books she would quickly get caught up with her housework and then off again to the library. It was not long before she out grew the small local library. From then on she caught the bus and then street car to take us to the library in New Toronto (a neighbourhood of Toronto). I remember it. It was old and quite large. The first library card I ever had was from this library. I think I remember having stories read to me by the librarian while my mother search out her choice of books. I assume libraries still have childrens' story hours. I always admired my father's secretary who for many years always volunteered to read the childrens' story hour at the central library in Mississauga every Saturday morning. The library I am most impressed with, in spite of the fact that I have only had a couple of chances to visit it over the years, is the new Toronto Reference Library. 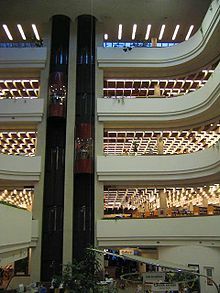 It is a fabulous library in central mid-town Toronto. It is five stories and very modern in all ways. Another view of the Reference Library where we can see the study desks, computers and the stacks on a floor above. 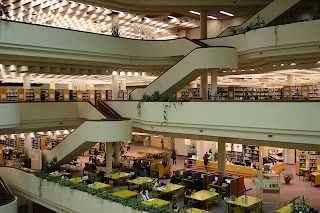 Toronto build its library system with the help of Andrew Carnegie, the Scottish/American Industrialist whose legacy in a large part is his funding of libraries and other educational institutions. 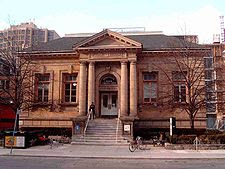 Ten Carnegie libraries were built in Toronto in the early part of the 20th century. Carnegie helped fund 125 libraries all across Canada in many small towns as well as cities. There is even one in Dawson in the Yukon. This is the historic Carnagie Library in the Toronto neighbourhood of Yorkville. 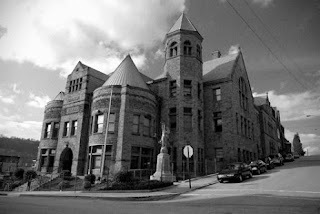 On one of my frequent searches on the Internet ( I was looking for the poorest places to live in the United States) I discovered the the first Carnegie library is in Braddock, PA. This was the location of Carnegie's steel mill. Sadly, Braddock today is a desperately poor community although only 8 miles from Pittsburg. It is a mystery to me how such a community could languish only a few miles from a major city. There is no city in Canada where a town so close would not be a prosperous bedroom community with housing costing hundreds of thousands of dollars. In Braddock you can still get a home for under $75,000. , and even much lower than that. It is a challenging community with a most unusual mayor. I encourage you to read about Braddock. It is the symbol of the demise of the heavy industry in the "Rust Belt" of America. It deserves better, if for no other reason than it is home to the first Carnegie Library, which was, at one time, in danger of being torn down. I could go on and on about Carnegie, Braddock and the role of free public libraries but I have written enough. Think about them. 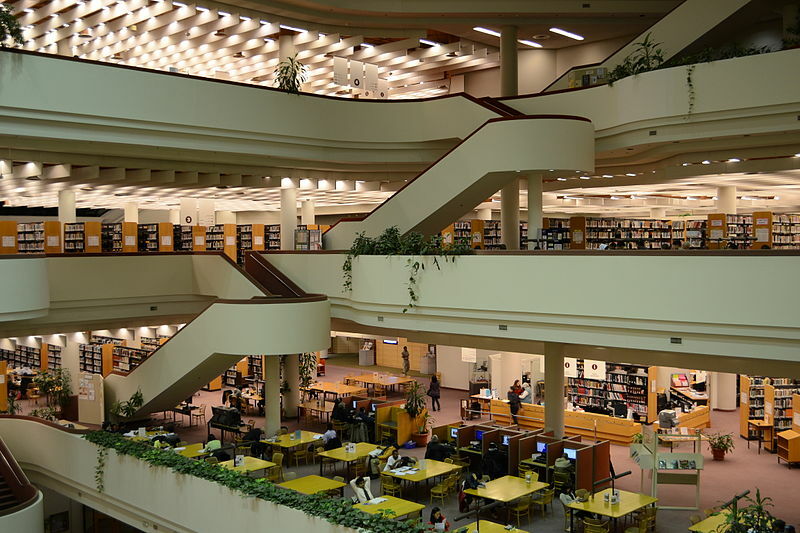 I think one of the things Toronto has reason to be proud of is its community based free public library system. The people of Toronto appreciate it and use it extensively. May it always be so. Winter's Last Gasp, I hope! one sees the first of March as surely the doorstep to the end of Winter. We got away with something, . . . . didn't we? No! Winter has one more teasing snowfall. This is the tail end of the dreadful tornado infected storms in the US midwest. I have no reason to complain about a little gentle snow, lower temperatures and some wind to drift the snow. I had a nice path cleared to the woodpile, as I was taking advantage of the warmer weather to bring in the rest of the wood, most of which I will not need until next autumn. Here it is. My wood pile and path covered in snow, the wet heavy kind that comes at the end of Winter. A cleared path to the road. This kind of snow is perfect for snowshoeing. That is one to the good! The snow bank across the road in front of the house. This is a bigger bank than we had earlier this Winter and all of Winter last year. It is similar to banks of snow that we used to get every Winter, all Winter, 20 years ago. It will be gone soon. March 15 is the date that the half load restrictions goes on the gravel roads so they will not be broken up by the large truck traffic as they thaw out. My house, tall and proud with its feet in the snow. I am snug inside, keeping the wood cookstove going, listening to the radio, reading, and diddling on the computer. Such is life these days. I promise this will be the last positing to Winter scenes, this season.